This has been my experience on deputation. God takes the burden for the Orokolo He has placed on me and puts it upon His people – and we bear the burden together! I am so glad raising support does not depend upon my being “up” for each service or the video playing perfectly, but instead is a work of the Spirit of God. We have been greatly blessed in our meetings these past two months. We now have 73% of our needed monthly support. We are praying that God would bring together our support, visa approvals, and travel arrangements by August. Please pray with us! We had a great time in Virginia and North Carolina before heading to Texas. 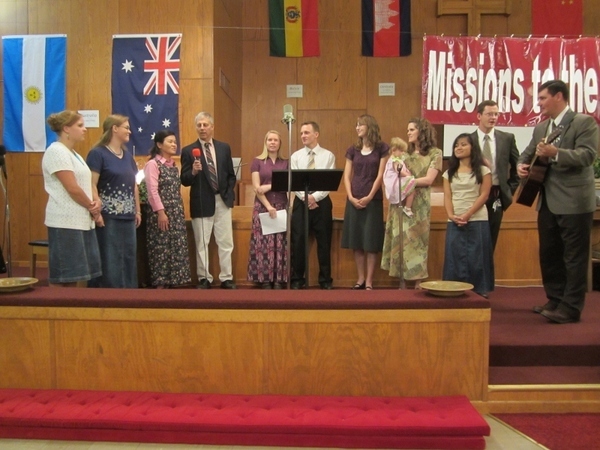 Each church took abundant care of us and we met some folks really fired up for missions! We had the extra blessing of seeing a daughter of our former Cheyenne youth pastor [Patrick Bell; moved on to glory by cancer] in Wilmington, NC. It was so nice to see Jessikha and meet the fine Christian husband God has given her. Those I call “my kids” definitely expand beyond the four to whom Trina gave birth! 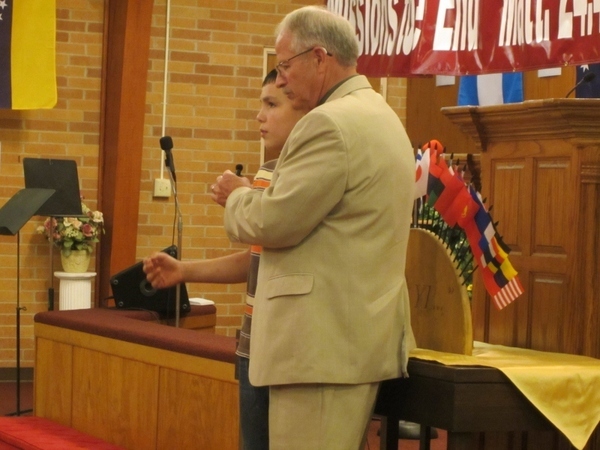 Our first meeting in Texas was at the church we went to last year while in linguistic school; one year too early. 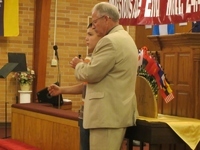 I am enthused to say that Heritage Baptist under Pastor George Newcomb is now one of our supporters in ministry! We were all over the state (BIG state!) and enjoyed each meeting. 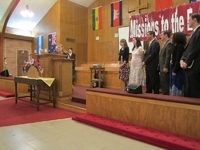 Two of the meetings were Pastor’s Fellowship /Missions Conferences and in each of these, God introduced us to pastors that later had us in for a meeting. 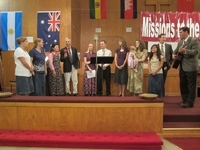 BBTI Missionaries - God is so Good in 6 languages - Great singing, everybody!! I had the special opportunity of preaching nightly at the first Annual Mission Conference of East Side Baptist Church in Bowie, TX under Pastor Jamie Reed! This began on Easter so my Sunday was open. The scheduled speaker broke down and also was quite ill. God gave me the privilege! 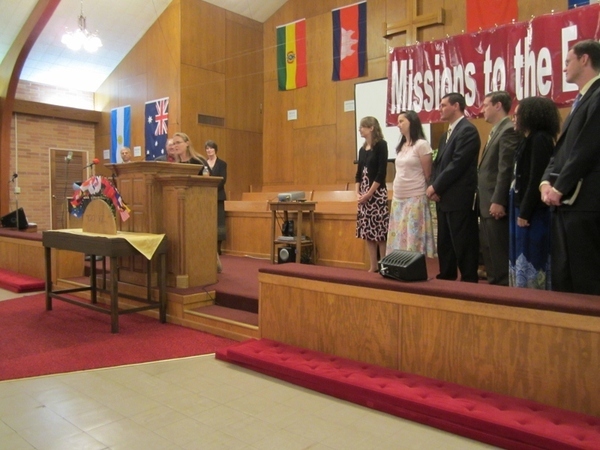 I am sure that all the missionaries of the Baptist Bible Translators Institute that were present were a bigger encouragement to me than I was to them. We truly had a wonderful time together. I had the unique experience of being with a pastor who had known of me since my salvation 31 years ago! Pastor Bob Wallace had been a youth pastor in the Chicago area in the church that sent out Warren Smith, the missionary that led me to Christ! When Pastor Wallace moved to Texas to pastor, his church supported Brother Smith and he continued to get reports of my growth, surrender to preach, and Bible college progress. He had not heard much about me in recent years, but was thrilled to hear from me and see the fruit that had come over the years through our family and ministries. We had a fun Wednesday night with these folks at Regency Baptist. I so appreciated the faithfulness of this pastor and the reminder of just how far-reaching the work of God can be when God’s people get and stay behind it! The past two Sunday evenings both churches we were in took us on for support right on the spot! Riverview Baptist Church in Borger, TX - Pastor Jimmie Gillmore and Cornerstone Baptist Church in Carthage, TN – Pastor Ron Ralph are our two newest partners. It is exciting to see the Spirit of God opening the hearts of His children to a new burden! I believe several other churches will soon be bearing the burden with us. We are looking forward to our meeting at East Denver Bible Baptist Church. We have known Pastor Richmond and his wife for years and are thankful for their work in Denver’s inner city. Mrs. Richmond and Trina are close friends. Pastor will be graciously keeping our car and taking us to the airport (DIA) for our next deputation adventure: North to Alaska!